Craftsmanship, longevity, and style: the three main elements of any Builford bag. Whenever we design a new bag, it has to fit with all three, as well as be usable and practical. It’s harder than you might think! We take a lot of pride in the design process at Builford, and are excited to be able to release this multipurpose backpack. It might look sleek and simple, but don’t be fooled: the Eagle backpack has two separate inner compartments. The back can fit a laptop or any other electronics and is padded to ensure its safety, while the front pocket, accessed from the front zipper, can fit books and notebooks. It has small pouches inside for a water bottle or any other small items you want to keep from bouncing around. 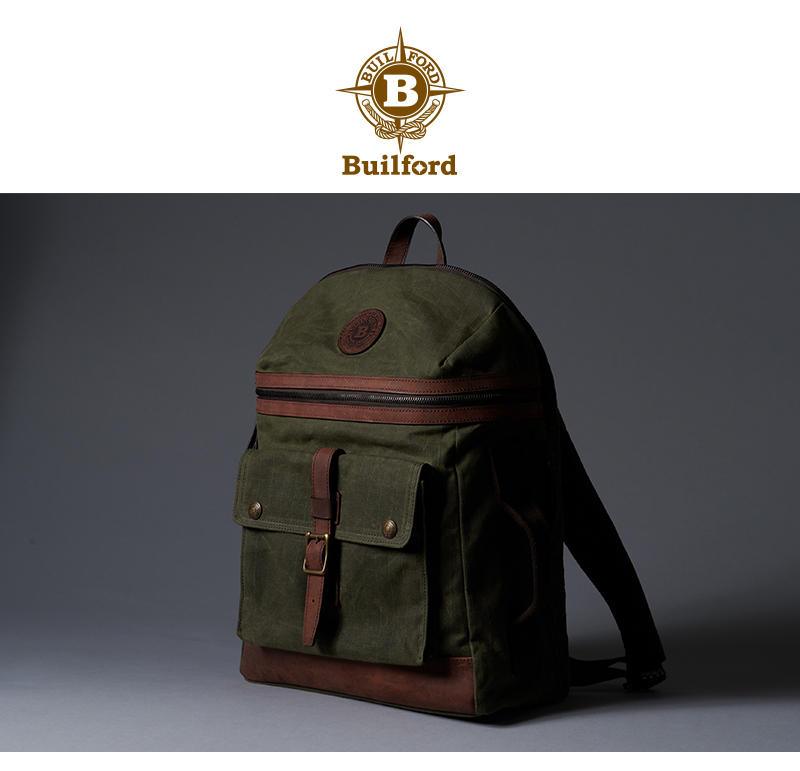 Like all our Builford backpacks, the Eagle is made of original Martexin waxed canvas with leather and brass accents. That means it is naturally waterproof and will age beautifully, deepening more and more into its natural vintage feel. Of course, the Eagle Backpack wouldn’t be a Builford backpack if it was only suitable for students — with the inner space, you can use it for anything from traveling to commuting. The side handle makes it extremely convenient to carry around or, if need be, haul it up into an airplane overhead compartment. We love the new rounded shape on the top of this new Builford design, taking a step beyond the usual squared off backpack top. We know how useful the magnetic lock is on the front pocket and kept it from many of our other popular designs. And of course, we made sure there’s a little pen loop inside the pocket. Builford bags are never lacking in those little details that make your life easier! To order your own Eagle Backpack, head on over to the Builford website. We like the charcoal grey (link) personally, but there are many other beautiful, vintage-style colors to choose from. Share the post "Builford Eagle Backpack: A New Model for Students"
Posted in Fashion Review and tagged builford, builford backpacks, builford design, Builford waxed canvas, eagle backpack, luxury vintage, vintage backpacks, waxed canvas backpacks. Bookmark the permalink.